With spring well and truly underway Yamaha heads to Istanbul in Turkey to collaborate with a new member of the Yard Built family, Bunker Custom Motorcycles. Brothers Can and Mert Uzer are not your typical custom bike builders, Can a high level skateboarder with the Vans Turkey Skateboarding Team and Mert transferring to building bikes full-time following a career in Digital Advertising. "What is really important for me is that they have kept the XSR700's agility and power characteristics that really define the bike. Around this they have added their very distinctive style, showing a whole new face to the XSR700." 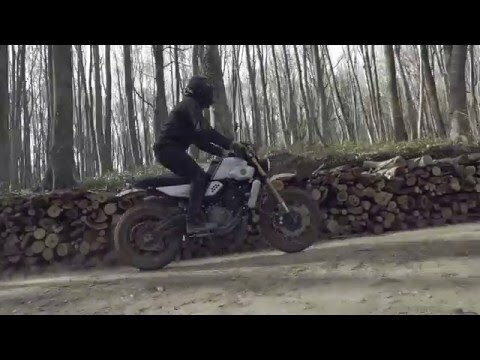 "I'm really impressed with the work Can and Mert have put into this build," commented Yamaha Motor Europe's Marketing Coordinator, Cristian Barelli. "What is really important for me is that they have kept the XSR700's agility and power characteristics that really define the bike. Around this they have added their very distinctive style, showing a whole new face to the XSR700." "We went for the tracker style as we really wanted to capture the spirit of freedom as much as possible," agreed the Uzer brothers. "The twin motor is the perfect base with its engine characteristics and the bike inspires you to create something light, agile and free." To create their tracker style interpretation of the Sport Heritage machine, Bunker Customs raised the seat position and made more room at the front for the rider to move around. They also went looking for more ground clearance, relocating the exhaust and changing the front wheel to a 19" for all-terrain riding. To stay comfortable and practical whilst looking good on rough roads the build swaps out the standard forks for MT-09 Tracer upside down units. The standard rims are also ditched in favour of cool Super Ténére spoked wheels on Goldentyre GT201 rubber, 19" front and 17" rear. A 5.5" aftermarket halo headlamp sits in a custom mount, complementing the custom front mudguard mount, both made from 8mm steel tube. For more about Bunker Custom Motorcycles visit www.bunkercustomcycles.com.